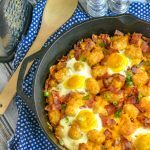 Totchos, aka tater tot nachos, aren't just snack food anymore- added to a cast iron skillet with bacon, and cheese they act just like hashbrowns with sunny side eggs baked right no top. It's a one stop shop kinda way to start the day. Begin by adding a single layer of tater tots to a 12" cast iron skillet. Add the remaining tater tots evenly out over top. Sprinkle the bacon, then the cheese, evenly out over top of the tots. Season with salt & pepper, to taste. If natural wells aren't obvious, use a spoon to create some divets- 6-8 depending on how many eggs you want to use. Gently crack the eggs, and pull them apart to slowly release a single egg into each well, careful not to break the yolks. Bake the totchos at 400 degrees for 22-25 minutes, or until the egg whites are opaque. Remove the skillet from the oven, and let it rest for 5 minutes. Top with green onions, slice, and serve.